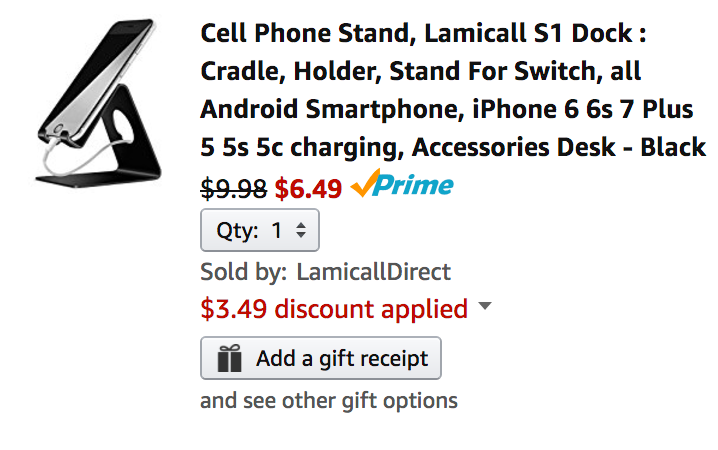 Lamicall Direct (100% positive feedback from over 4,000 shoppers) via Amazon offers its Smartphone Stand/Dock for $9.98, but if you check out with code 6VGBXP2D the price will drop to $6.49 Prime shipped. That’s a discount of $3.49 and the lowest we’ve seen it at Amazon. This stand works well with most iPhones and Android devices between 4-8 inches and is “perfect angle of view for using FaceTime and YouTube.” It’s made of an aluminum alloy with smooth edges and it is lightweight. Rated 4.8/5 stars by over 5,000 Amazon shoppers. STURDY:Design with low gravity center,lightweight but sturdy. MODERATE HEIGHT; The height of hooks to bottom is moderate to charge your device,also keep the low gravity center. EXQUISITE WORKMANSHIP:Black aluminum alloy,smooth edge,Technology of Highlights,portable.It should be in your office, kitchen, nightstand. Other:Cooling your device while charging.